This week I'm thinking about Ted Benoît's 1982 graphic novel Berceuse électrique, which had been serialized in the pages of (À Suivre) over the previous two years and represented an early (and, for my money, highest-ever) peak for the ligne claire revival of the late 70s and early 80s. Cover to the first edition. Some basic history may be in order if you don't know what I mean by ligne claire revival. "Ligne claire" is the French for the Dutch "klare lijn," as coined by Joost Swarte in 1977 to refer to the Belgian cartooning tradition (founded and popularized by Hergé) of simplified characters in a carefully-rendered landscape that abjures contour, hatching, or line weight variation: all the drawing is done in outline only, and the storytelling was classically just as straightforward and direct. The style, like Tintin, was popular all over Europe by the middle of the twentieth century, but by the late 1960s, when Pilote, which had closer ties to the competing Marcinelle school which prioritized action, feathered lines, and sharp, ironic writing, had transformed Franco-Belgian comics in much the same way that Marvel had transformed US comic books, ligne claire felt old-fashioned and cartoony: kid's stuff. But then a cadre of underground cartoonists started to use it again in the 1970s to make ironic commentary on the vapidity of contemporary life: Joost Swarte, Harry Buckinx, and Theo van den Boogaard in the Netherlands, and Yves Chaland, Floc'h, and Ted Benoît in France. The curlicued emanata here are a well-known Hergeian trope. By the 1980s, the revival was no longer fully ironic, but had morphed into a reclamation of the ligne claire style as a method to tell complex, adult stories in a deceptively clear and attractive manner. Chaland's Freddy Lombard, Floc'h's Francis Albany, and Tardi's Adèle Blanc-Sec went on adventures that Tintin might have had, only actual death, political realities, and the grim ironies of age and change dogged their footsteps, and their albums ended on equivocal notes rather than with slapstick resolution. That went double for Benoît's Ray Banana, a pastiche of hard-boiled noir heroes almost never seen without his eponymous sunglasses. Where Chaland made commentary on European colonial history, Floc'h took whodunit Anglophilia to baroque heights, and Tardi pitilessly dissected the soul of France, Benoît was fascinated by American iconography and mythmaking: some of his earliest ligne claire stories in the 70s were straight-faced interpretations of classic alien-abductee paranoia, and there's as much Hitchcock as Hergé in Berceuse électrique. Like many a noir hero, Ray is nervous about meeting cops. That title, by the way, translates to "Electric Lullaby," and is a brand name for a product that is supposed to help you sleep but instead triggers hypnotic suggestion: under its influence, Ray rushes out to help a cult run by a charismatic fourteen-year-old kill a rock & roll singer and a Russian cosmonaut so that robot lizard people can take over the planet. Jordi Costa's introduction to the 1985 Spanish edition (the only one I've read in full; my French is only good enough to appreciate the language once I've understood the story) invokes Pynchon, Vonnegut, Ballard, and Alan Moore as comparison points for stories about a world slipping into chaos, and something of Pynchon's nesting-doll conspiracies and flavorful absurdity is at work here. Ray's sunglasses allow him to blend into a convention of the blind in a beautifully-drawn sequence in the worst of taste. Although because it is both ligne claire and noir, there is a grimly satisfying resolution to Ray Banana's story; the sequel, Cité Lumière, leaves many more questions open. And that's all there is: Benoît scripted a further album about Ray's landlady, drawn by the even more meticulous Pierre Nedjar, and illustrated a prose story about Ray by Philippe Paringaux, but there are only two Ray Banana "Adventures in the 20th Century" — unlike most comics heroes regardless of hemisphere, there has been no running of Ray into the ground, no extensions or revivals or adaptations into new media. Even when Benoît brought him back in the 2010s for a series of strips published on his blog under the title "La philosophie dans la piscine" it was only as a sort of autobiographical stand-in: his line no longer clear, dispensing entirely with plot and narrative, Ray-as-Benoît ruminates on the existential questions of middle age and late modernity; he died in September 2016, just as the world turned even more Pynchonian. The femme turns out to be as fatale as they come. 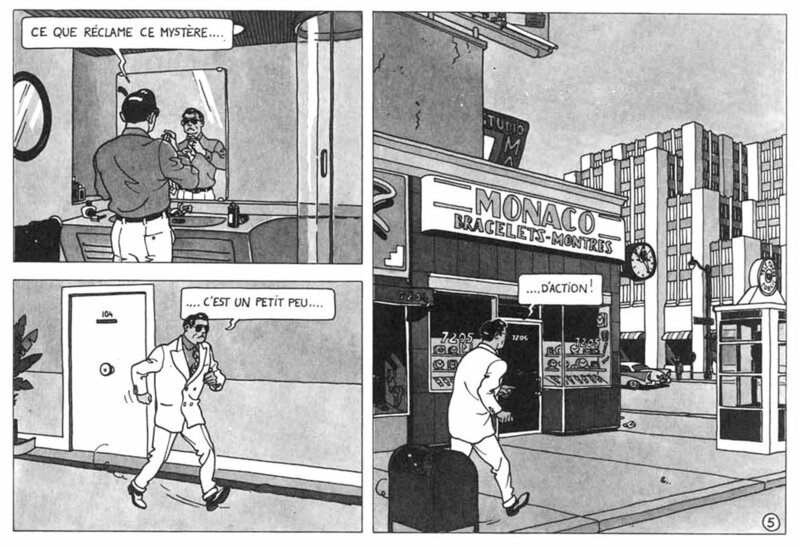 In contrast with the original ligne claire canon (Tintin, Blake et Mortimer, etc. ), which was staunchly anti-Communist and pro-Western European paternalism, even allied to fascism, Benoît's villains are capitalists and press barons: the Soviet cosmonaut, perhaps the only wholly decent person in the story, is resistant to the cult's mind control because, as Benoît explains with his tongue firmly in his cheek, Communists are so well indoctrinated in dialectical materialism that critical thought is second nature to them. Not that any of this is meant to be happening in the real world: Ray's home city is called Metropolis, and while the midcentury modern décor and technology would suggest it's the 1950s, a middle-aged man was born in the 1960s, and a newspaper carries the then-future date of 1992 — an intentionally loose chronology that lives up to the series title "Aventures au XXe siècle," as the whole twentieth century is condensed into a fantasmagoria of iconography, comedy, and action. A single panel blown up to scale, just for reference. The earliest editions of the book sport a grayscale wash that to my eyes is much more attractive than the uniform digital grays of the current editions; I prefer handmade variation in tone and color as a counterpart to the wobble of Benoît's hand in even the most carefully perspective-drawn lines. He was in his early thirties when he drew this, a satirical summation of classic Hollywood style, Cold-War paranoia, and Eighties postmodern cool. The fact that it hasn't really remained in the canon of great comics outside of a small Francophone fanbase speaks to a number of ways in which comics culture has changed since the 1980s; ligne claire no longer carries the cultural weight it once did, even in Europe, now that it's been used ironically almost as long as it was used sincerely. Postmodernism is also not much in vogue anymore: audiences generally prefer visceral emotion to dense referentiality and ironic distance. And while a carefully-composed French take on American junk culture might be respected in film, where it would be branded New Wave and studied for its uninflected deadpan style, in comics it's just another instance of junk culture, only attractive to the already obsessed. Ray sets forth on his adventure.